Essentially a good writer makes his or her writing come alive by using descriptive writing. This can be done by describing a place, an object, a person, an emotion. Descriptive writing works when the subject is brought to life. Once way that this is done is by using concrete nouns, decorated by colourful adjectives. The nouns can also be described by sensory details - touch, sight, smell, taste and sound. Descriptive writing should also contain varied and interesting verbs. On this page you will be given instructions on how to teach descriptive writing and some free graphic organizers to help you teach this writing skill. So, how do you teach descriptive writing? ﻿In order to teach descriptive writing, the first thing you will need to do it to place excellent models of excellent writers into their lap! ﻿First, you select an excellent piece of literature - Take note of the descriptive writing techniques the author used and put it into practice in your own writing. Another way to teach descriptive writing is to work through stylistic elements of writing. I will explain this process below. If you like, you can print these instructions and free graphic organizers for your child. does exactly that! 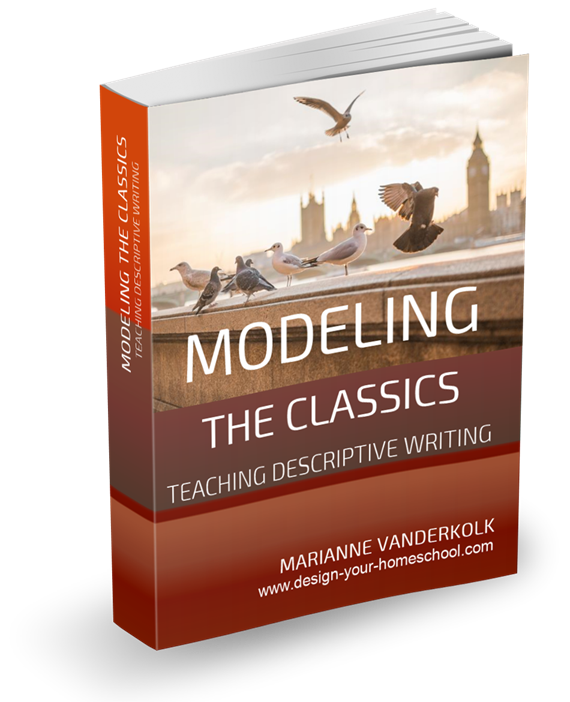 In it you will find excellent models of descriptive writing, followed by questions which help the reader identify the author's techniques. Then, using graphic organizers, the student creates his/her own descriptive writing based on the model. Choose a Topic (person/ animal/ place/ object) If you're not sure how to choose - list all sorts of things which you know something about . Write you ideas down on this Ideas Wheel. How much do you know about your subject? If you don't know a great deal.... start to research. Get out some books. When writing descriptively, you want your audience to have a mind picture of your topic. Use the Describing Wheel page. 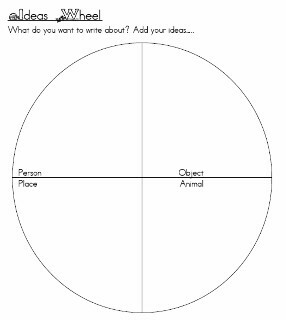 Write your topic in the center and describe your subject by using your senses. What does your subject look like? Put in as much detail as you can. Write it in such a way that a blind person can picture it in their head. What does it smell like? Is it pleasant? How does it feel to be touched? Is it smooth, rough, hard, soft? What sounds does it make or what sounds does it remind you of? Use phrases to describe your topic. You can begin with, "...like a...." or " it reminds me of ...."
Now write your descriptions down into a paragraph. Underline the nouns you have used or colour them in green. Do you the nouns you used? If not, add the nouns you'd like to change to the Choosing Better Nouns and Adjectives page. Look for different nouns. Use a Thesaurus to do this - or even try the online Visual Thesaurus. It's a lot of fun! Once you've chosen your better sounding nouns - try to describe the nouns. Ask these questions to the nouns you have. The words you now have are adjectives. They describe your nouns. Add these adjectives to the Choosing Better Nouns and Adjectives page. Make your adjectives interesting by thinking of adjectives which are colourful and full of meaning. Choose ones which create a word picture - like 'slimy' or 'verdant'. You might now like to re-write your paragraph. It will contain your descriptions using your senses and your nouns will be interesting and will be described by colourful adjectives. However, be careful not to overdo it. Not every noun needs to have an adjective. The words you now have are adverbs. Use them to add interest to your writing. Add them carefully and thoughtfully. Don't overdo it! Now re-write your paragraph of descriptive writing. You should have nouns, adjectives, verbs and adverbs which are packed with meaning, colour and thought. You may wish to add phrases and clauses to your descriptive writing. Use this phrases and clauses worksheet. If you want to make your writing longer you would need to define your paragraphs and choose a sub-topic for each paragraph. For example, if you are describing a person, you may wish to describe their appearance in the first paragraph, their hobbies in the second paragraph and their character in the third. It would be similar for descriptive writing of any topic. Show your final copy. Read it aloud to your family. Publish it. 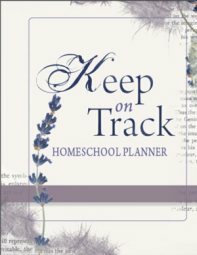 Why not add it to the Homeschool Gallery on my site? We'd love to see your work. Print these instructions and all the graphic organizers. 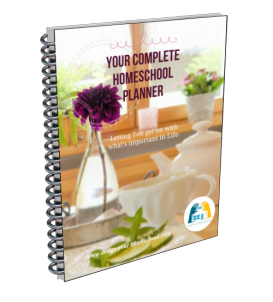 Do you want to know more about - How to write Language Arts Lesson Plans based on Literature? See my 10 Day Outline. 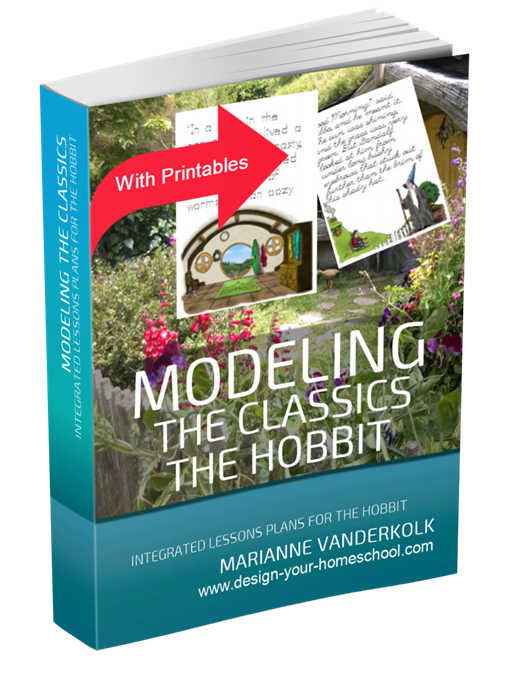 I have used this Ten Day model when writing my 200+ page e-book, Modeling the Classics: Language Arts Lessons from the Hobbit.